4 Thread -Semi-dry-head, High-speed, Overlock / Industrial Overlock machine/Serger - Self-oiling with built-in reservoir. The JUKI MO-6814S is easier to use and promises superior cost effectiveness. 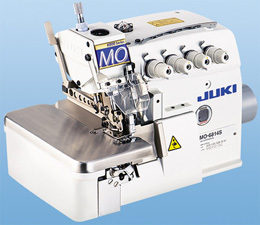 The Juki MO-6844S sews various kinds of materials while further reducing operating noise as well as increasing durability. This advanced 3 thread overlock machine is easier to use and promises superior cost-effectiveness.